Time is whirling away and I can't quite believe Red Rose Baby is now four months old. It feels like he's always been here but also feels brand new still, but I think we're really becoming accustomed to life as five now. This newest little character is really starting to make his presence known and his personality is definitely coming through. He's very chatty and we're able to have lovely little 'conversations' with him. He makes me laugh as he tries to focus on your mouth and words and then tries to reply. Little E is a lovely baby. He's happy and sunny and bright. He's very relaxed, as long as his needs are met. This month has seen him really start to assert himself though and he cries a bit more readily if he feels like he's not getting the attention he needs. He has a sad little cry which guarantees that the nearest person will drop everything to rush to him, whether it's me or his Daddy, or his big brother or sister. The second set of immunisations were given this month, we ended up delaying them by around four weeks through being out for the day. Little E being unwell and then a clinic cancellation. I was quite pleased by the delay as he received the new Meningitis B vaccination when we went and this made him quite unwell for a few days. The advice is to offer three precautionary doses of paracetamol following the injection and I gave these to him but it took him about three days to feel himself again. Apparently 80% of babies have a fever after this jab. 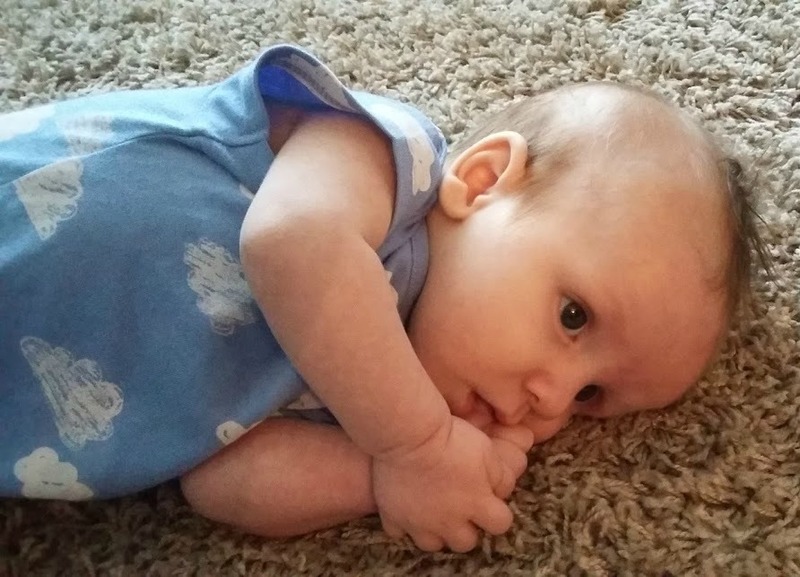 He's starting to love being upright and will take every opportunity to be on his feet, if you hold both of his hands firmly he will attempt to pull himself up and then he stands firmly, albeit wobbly, and looks delighted with himself. He is able to really push through his feet which is making me think he might be early to get mobile, I'm not ready for an early walker though so I hope this doesn't happen too soon! I'm trying to borrow a Jumperoo to see if he likes it. Bud loved his but LM cried every time we put her in our old one so I wonder which of his siblings he will be like. We're trying to give him as much floor time as we can at the moment and he will move around on his mat. He doesn't like tummy time and gets quite cross about it. Although he readily rolls back to front he doesn't seem as keen to roll the other way (even though it's easier). He has a funny wriggle that he uses to get around and you pop him on the mat in one place and come back to find him somewhere else, he seems to move imperceptibly. We're at that in between stage at the moment where he's not a newborn but hasn't really started to 'do' anything. He is learning to sit but nowhere near doing that independently yet. My wonderful sleeper has had something of a wobble this month. I think in line with the four month sleep progression. He's needed more milk at night and we had a full week of very disturbed nights. I was hoping to get him into the routine of going to bed earlier in the evening but that just hasn't happened and he's still staying up with us in the evening. He's only really napping briefly in the day if we are at home although he sleeps well in the pram when we are out. I imagine that the next couple of months will see some big changes for Little E, I think he's on the edge of a few developmental milestones and we have weaning to come. I'm so excited to share his journey with you all.